>Golden Brown: How Gordon might have pulled it off? 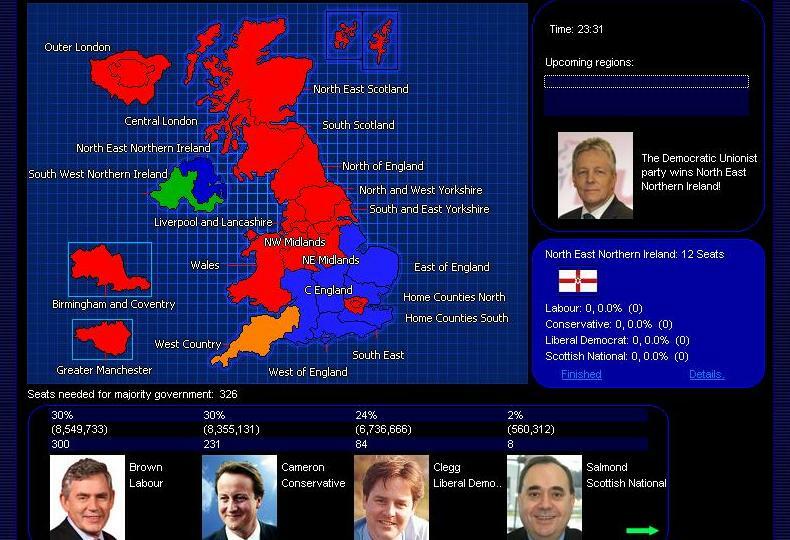 And here’s a UK election result you won’t see this Thursday – again courtesy of the Prime Minister Forever 2010 computer simulation game: Labour and the Tories tied for the popular vote on 30% with Labour gaining 300 seats and Cameron’s Conservatives way behind on 230, and also marginally behind in terms of popular vote. The Lib Dem advances proves – as in real life and the last simulation I played – hard to stop, but this result is in terms of political consequencs the mirror image of the previous simulation: Lib-Lab co-operation with electoral reform in weak form on Labour’s terms. The trick? Intensive debate practice for Gordon (he and Nick Clegg drew all three – Cameron as in two of the three real life ones ineffectives – and, of course, keep him away from the voters and stick to set piece events; coupled with a strategy concentrating on attacking the Tories in big cities and the electoral battlegrounds of the North West and Midlandss, more or less sacrificing Labout MPs in the South East and East, who were duly decimated at the hands of the Tories., so their colleagues in London and Birmingham could hand on against the odds. 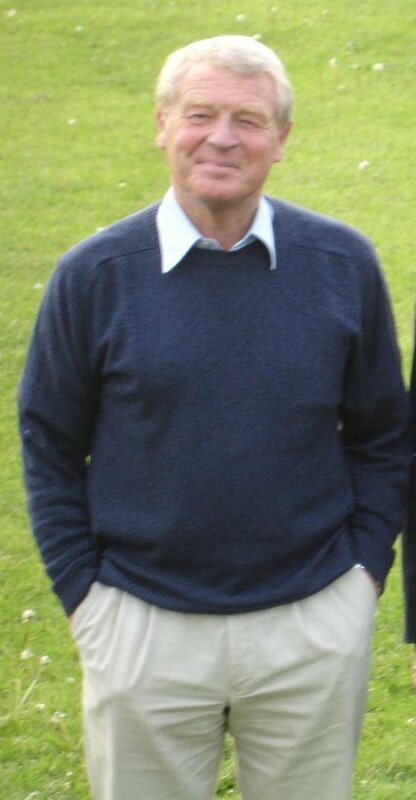 The upside of this from the Labour point of view was also that the low Labour vote in the South allowed the Lib Dems to win a few seats unexpectedly off the Tories – including, wonder of wonders, Mid-Sussex. The Greens, again, picked up Brighton Pavilion. t looks like some kind of Lib-Con pact is on the cards, probably centring on electoral reform, but the Lib Dem hand isn’t as strong as it might of been if Dave can buy off the Scottish and Welsh Nats – who hold a total of 12 seats and the Democratic Unionists. Things look very bad for Gordon Brown – Labour was outpolled by the Lib Dems (26: 25 per cent) and Labour has just over 200 seats. Minor parties did better than anticipated though: Caroline Lucas came through the middle to take Brighton Pavilion, as did Salma Yaqcoob for the Respect party in Birmingham Hall Green. The BNP polled a scary 21% in Barking. OK, I admit it, I haven’t had an out of body experience, slipped through a time warp, Nor has my wife been sllipping pyschotropic substances into my Nescafe. 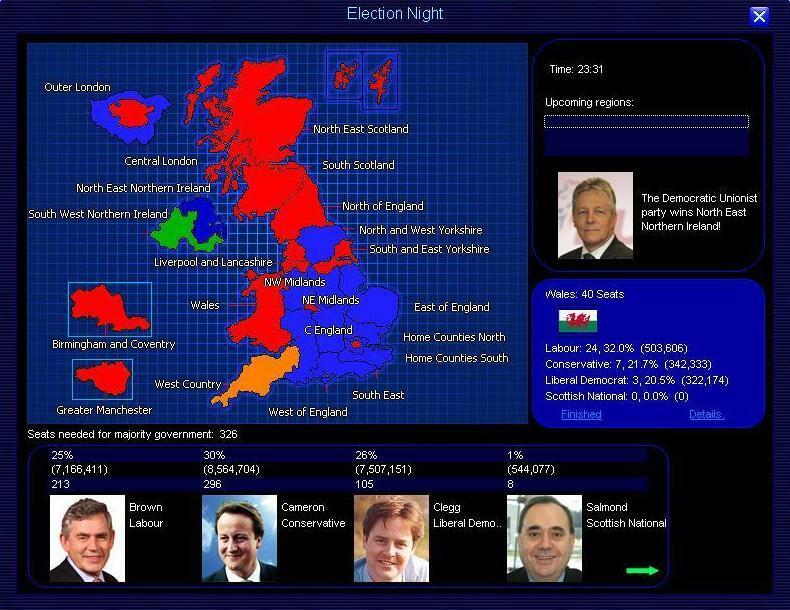 I was playing Theory Spark’s excellent – if rather belated – update of election simulation game Prime Minister Forever 2010. The game is based on their very successful President Forever game, which simulates US presidential contests (including primaries – it’s incredibly hard to win as Obama, by the way, and boy is Iowa crucial). For computer game buffs, I should say it’s essentially a resource management game with no very flashy graphics and you need to play experimentally a couple of time to get the hang of it, but there’s not too much to keep track of and enough real strategy there to make it intriging challenge for anyone with a serious-ish interest in electoral politics, who fancies themselves an armchair election general. 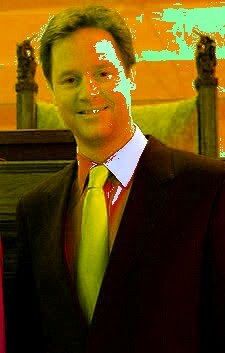 My strategy as the virtual Nick Clegg was to try to match what has actually happened over the last weeks cencentrating on winning TV debates and building momentum for third party breakthrough, campaigning mainly in marginal seats South and West of England and relying on the Big Mo to secure Lib Dem seats elsewhere, especially Scotland. It was tough: Gordon Brown did unexpectedly well in the first debate, but with better preparation I achieved the same kind of breakthrough the real life Clegg did in debate 1, only in virtual PC debates 2 and 3. Indeed, astonishingly my political timing was, I think, rather better than that of the real Clegg Cleggmania took hold a bit later than it has in real life eaving the Tories little time to bounce back. Gordon’s early momentum burned itself out, you will be unsurprised to hear. 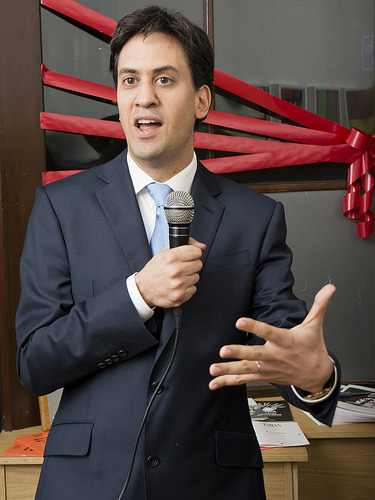 My mistake though was not to campaign in the Midlands, where the Lib Dem electoral surge tended to open the way to the Tories, tranforming them into three-way marginals. The result was a distinctly Pyrrhic victory. A growing addiction to US politics has slowly crept up on me – at least for non-academic purposes – and, may God forgive me, I’ve been following the primaries closely. The collapse of Rudy Giuliani’s bold strategy of missing out the early primaries to concentrates on victories in big diverse states is particularly interesting. But could it have worked? Just to see, I replayed it during a coffee break on the excellent President Forever political sim game:- you can generally knock together a campaign strategy and get to Super Tuesday in half an hour or so. In this scenario running the Giuliani ticket, I was a little more cautious and did a little better than the real Rudy and his advisors. I won Florida handsomely. But the result and campaign dynamics were, sadly, basically the same: the frontrunner coming out of Iowa and the early small state primaries had so much momentum, he just blew me away (see map above). The main difference between my virtual tilt at the White House and the real one was that the frontrunner that crushed me was Mit Romney, not John McCain. Bad news for liberal Republicans in some alternative reality, but I guess is just about possible. I did manage to pick up California on Super Tuesday though, thanks to early endorsement by Arnie Schwarzenegger, but by then was then so busy barnstorming key states and throwing cash at last minute advertising to shore up my rapidly eroding polls leads it was too late. I even managed to lose New York for Rudy! Not that it made a difference given Romney’s dominance across the Midwest and the South. Hasta la vista, baby.